I love the little Herend figurines and was shocked when I stumbled upon this Expressions version for only 22 dollars! Would you ever scoop up the elephant on the left, or would you stick to the original? Wow that's an impressive find! I wish they had the hippo one as a cheaper option too. Happy weekend! 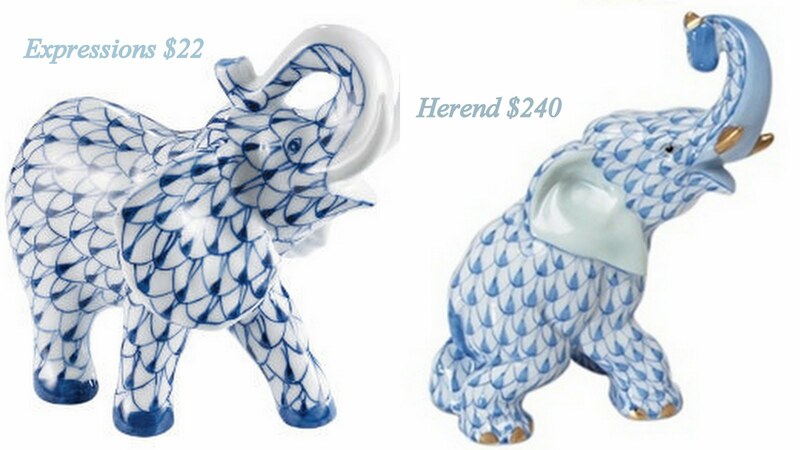 yikes... fake Herend??? No thank you!!! I love the baby elephant though! I have him in pink... one of my favorites! Love the $22 one better! i'd get that one. This is one time I would get the knock-off! I would move him around (like on a low table where he could be touched) - maybe even outside in the summer. No worries when it's $22! Those "fakes" are all over by Andrea Sadek. The painting on the Sadek is not as nice.